Food Huggers are reusable wraps that preserve leftover fruits and vegetables without disposable cling plastic or aluminum foil. These colorful "second skins" slip on and off easily, keeping perishables fresher, longer. Made with food-grade silicone, they are 100% BPA- and phthalate-free. 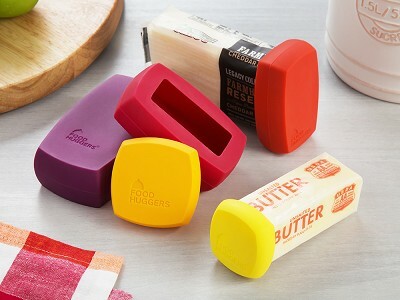 Food Huggers were created by Michelle Ivankovic, an industrial product designer by trade, and Adrienne McNicholas, a marketing strategist, who first met 15 years ago in the home goods industry. Both foodies at heart, Michelle and Adrienne became fast friends and most recently inventors of these clever little savers designed to maximize taste and minimize waste of half-cut apples, lemons, onions, tomatoes and more. Dishwasher, microwave, and freezer safe, Food Huggers come nested in four different sizes that can accommodate your partially-used produce, both big and small. The huggers also seal glasses and jars too, perfect to keep that half-consumed drink fresh for later on. Amy from The Grommet team filling in for Food Huggers today. 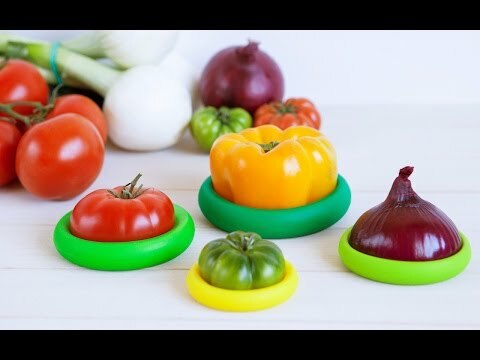 If you're someone who loves your fruits and veggies, but struggles to keep them fresh you will appreciate this Grommet. Food Huggers are reusable covers designed to save that half of a lemon or an apple you don't want to throw away. Let me know if you have any questions! Amy, this is great! How about one for an Avocado? Great idea. The team is looking into adding this additional product and will keep you updated as soon as it's available. 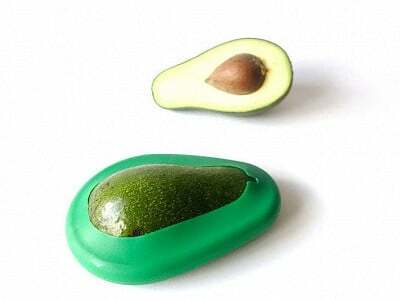 @Amy why wouldn't one of these work for avocado as well? I think this is a great grommet! silicone is proving a great tool for the kitchen in so many ways! There is an Avacodo Hugger on the Food Hugger website but it's not available here on The Grommet. Why not? How long does the fruit or veggie keep using these? @Diana - Hi Diana, thanks for the question. I tested these at home and appreciated how they kept the edges of my produce moist for days. The end of my cucumber didn't dry out, and a lemon I used was still perfect and juicy about 4 days later. I also tried a pepper, and though I find peppers to be pretty long-lasting anyway, it was also still fresh when I chopped it for dinner a few days later. The airtight seal the Food Hugger gives is key, but how long your veggies will last also depends on how fresh they were to start with. If the veggie is normally stored in the fridge, would you do the same or leave it on the counter? @Theresa I would store produce the same way you would without the wrap ... the wraps will prevent the produce from oxidizing too much, but you still need to store it properly. Yes, agree with Colleen. 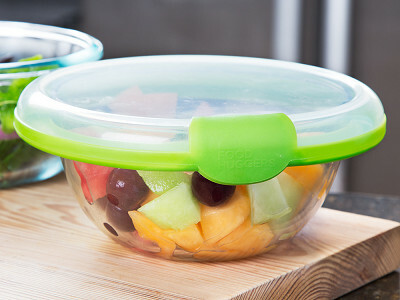 While Food Huggers will help to keep it fresh longer, there is still the need to store it properly. It is not meant to replace refrigeration. @Amy I have found tomatoes are best if not reffrigerated, so I assume this would be the case after its cut and hugged? I would recommend refrigation after cutting a tomato. That's how I do with cling film, so I would do the same with the Food Huggers. I am wondering if I could use it for lettuce or cabbage? If not, what could you use? Will it stretch for melons? Hi Laurie, thanks for the question. It's tough to say exactly how much longer the food huggers will keep your food vs. traditional plastic wrap or tinfoil, as some of this depends on how fresh the fruits and veggies are when you place them into the food hugger. Our testers have found they keep everything fresh for several days. It's possible that tinfoil or plastic wrap will keep as well, but Food Huggers is a simpler, re-usable way to keep your food fresh. Wait, let's discuss the fact that nobody should be storing edibles in plastic or tinfoil, anyway! They're poison! I already DO store little cut items like that, on dishes, or jar lids, but they're not snug like silicone. How do you keep the Hugger's clean? It's very simple. You can rinse or hand wash them in the sink, but they're also dishwasher safe. @Amy are the sizes of each item adjustable to different sized vegs or fruits? The smaller food huggers can stretch a little but they aren't designed to be adjusted drastically. How about a square one that would fit over the end of a stick of butter? I hate trying to wrap the paper around it or using plastic wrap. This would be great!! That is a great idea! 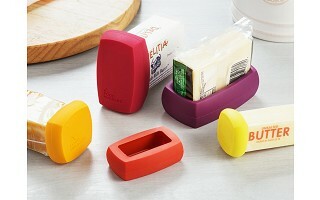 Then hopefully it would prevent the butter taking on smells from the fridge too! Do they retain the odor of the food? Do the huggers let go of odors after washing? I am wondering if I would have problems after using one with an onion. @Kate I would think that since they're silicone, they would release oders. Hopefully, Amy knows for sure but I do know that silicone is is quite impervious to "outside influence" due to it's molecular structure. Depending on how strong the odor is, these will typically release any odors after you wash with some soap and water. They're also dishwasher safe. How about a hugger for the tops of all the tupperwear I have in my cupboard? I can never find the tops! Do these fit over mason jars? Do they seal well enough to transport? 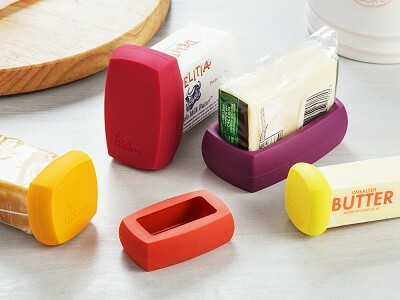 The Food Huggers are designed to keep items fresh in your fridge or around your kitchen. They aren't designed to be used for heavy transport. I was planning to buy a set for me and all my relatives...until I saw they're made in China. Sadness... I buy US made or I don't buy at all. @Alina Chinese people need employment too! I HATE this boycot on Chinese made items! They are human beings, just as we are, and they need jobs just as well, probably more so! We have an over abundance of jobs, if people will only do them, and not expect to paid an arm and leg. If people need a job, a meanial job is below ANYONE! They should get off their duff and go to work, regardless of the pay! @Alina, it should read-is NOT below ANYONE! I also have refrained from buying anything made in China, for many reasons. So I've passed on some promising products here. Sad, but I'm sticking to my guns. Thanks for your thoughts here. Our comment board has always been designed to be a sounding board for our community and their opinions and values. While many of our Makers try their hardest to have their products manufactured in the U.S., it's not always realistic. It's very funny how many say they won't buy this product (and others) since they're made in China. I can guarantee that at least 85% of the products in their home is China made. Furniture, clothing, appliances, utensils, pretty much everything you buy in a chain store is China made. Then if they see it's not China made, they complain about the price. You can't have it both ways. Production has left the US because we want to shop at Walmart and Dollar Store and won't pay more for the same product made here. Yes there are some exceptions but not enough to justify the resurgence of US manufacturers. That is why I don't shop at chain stores. You'll NEVER catch me in a walmart. Manufacturers move their production to China because labor is cheaper so that they reap greater profits. In the end, that's the name of the game for manufacturers. None of my furniture is made in China... none of the clothing I wear. You can find US made items if you search a little harder. I ESPECIALLY don't buy Chinese made items because of the recent issues surrounding children's toys and dog food ingredients that have been tainted with toxins coming from China. No thank you - if you want to buy items made from there, have at it. @Alina I don't like to buy items made in China because CHINA IS A COMMUNIST COUNTRY. But they do love making money from the US and then buying property here. I was thinking of these for gifts. Are they packaged attractively with info on how to use! While we don't have any cat food here at the office to test, I'm familiar enough to know that cat food cans are about the size of a can of tuna, perhaps a bit smaller. That being the case, the 2nd or 3rd smallest Food Huggers in the set should fit over the can. Hi Amy, how "tight" do these get? I mean do they bruise the fruit or veggie as they deal? I know I could just cut off a slice but was wondering on the stretching and sealing ability. These aren't mean to create a perfect seal for carrying or heavy transporting. They are tight enough to lock out oxygen so they keep food fresh longer in the fridge or on the counter. There is no bruising involved. If the smaller huggers need to stretch a bit to fit over something, that's not a problem but they aren't mean to stretch very far. The 4 different sizes that come in each pack do work pretty well for different sized fruits, veggies or jars. 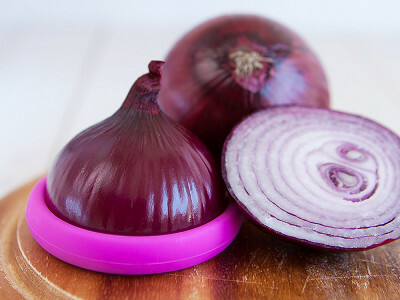 It's up to you whether you'd like to keep in the fridge or not but the open side of the onion won't release odors since it's face down in the Food Hugger. How about a large one for a 1/2 watermelon? Another storage problem might be solved. That would be a good idea, indeed. One of my summertime favorites.